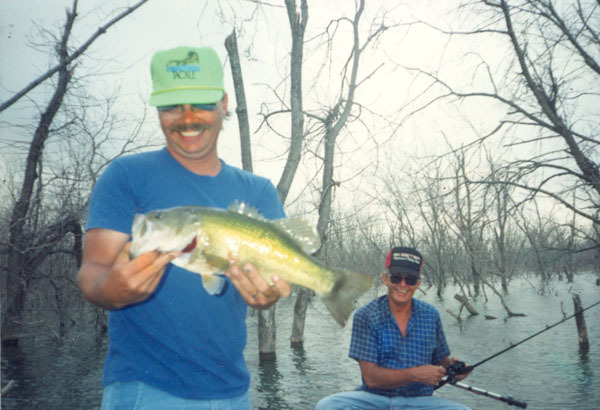 This is Carol with Mark Stevenson, Mark held the Texas State record for large mouth Bass from 11-26-86 till 1-24-92 and is still in 2nd place with his 17.7 lb. fish. Had a great time, caught some nice fish and learned some good spots..
Take a kid fishing and you'll see a smile like this too. 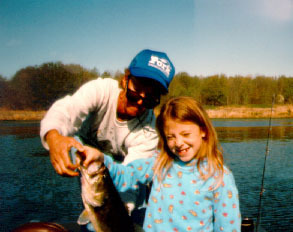 This is Jeri, Randy Womack's oldest daughter. 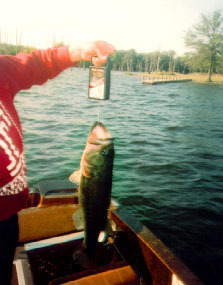 I don't remember how much this one weighed, but 7 Bass over the slot (14-21 in) came out of this location in 3 weekends. We couldn't find any structure so we settled for this grass line by a hump just off a creek channel bend..Not much to choose from, Huh? Night fishing is always good, or maybe it's just cooler. I'll work on my tan this year. 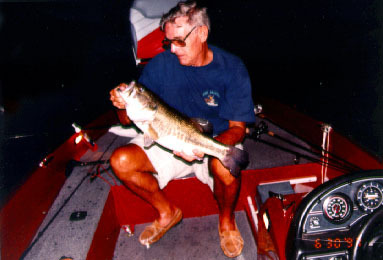 This is Randy Womack, he really enjoys catching these little boogers. 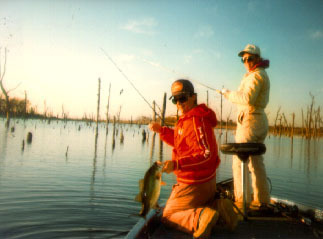 This is what Lake Fork looked like when we first started fishing it. 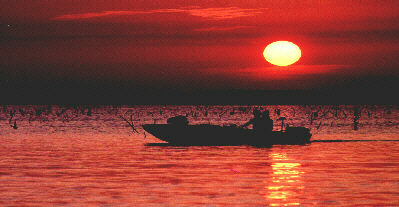 Let me hear from you, I'll tell you about Lake Fork. This is what you get when you mess with my fishing, I warn you.